Respected birth injury lawyers serving Washington, D.C. The birth of your child is a joyous occasion, and most parents want the same thing: 10 fingers, 10 toes and a healthy baby. When your child suffers a birth trauma caused by negligence, however, how you feel may take a backseat to two particular questions: Why did this happen? What can I do? 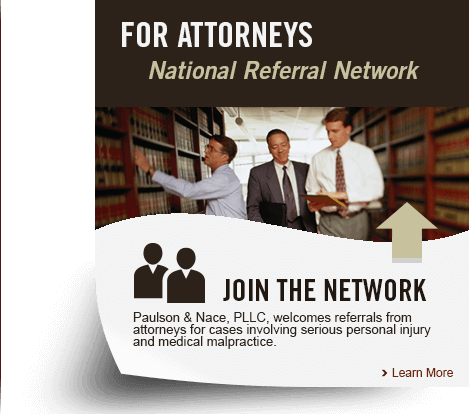 At Paulson & Nace, PLLC, we have helped families who are in the same position you are now. For the last 40 years, our team of medical malpractice attorneys has sought answers for families throughout Washington, D.C. after their children were injured at birth. We are your champions for justice and your advocates for your future. If your child has suffered catastrophic harm because of negligent healthcare, we want to help you protect your child and your family. Bleeding in/swelling of the brain. Fetal head trauma caused by CPD or by Pitocin-related contraction problems may cause your child’s brain to swell. Without immediate diagnosis and treatment, your child risks permanent brain damage and developmental delays. Brachial plexus injuries. If your child’s descent into the birth canal is arrested, the doctor must decide whether to perform an emergency C-section or to try to guide the child out manually. Excessive force can injure the nerves in your child’s neck, shoulder and arm, leading to a brachial plexus injury such as Erb’s palsy or Klumpke’s palsy. Cerebral palsy. Cerebral palsy affects the brain, and is the most common birth-related disability. It may take longer for the symptoms to manifest, and there is no cure. Hypoxic Ischemic Encephalopathy, or HIE. HIE is oxygen deprivation, and it can be fatal. It occurs when a fetus is unable to get the proper amount of oxygen during the birthing process. Doctors who fail to monitor your child for signs of fetal distress put the baby at great risk of permanent brain damage. Brain injuries caused by decreased blood flow to the brain are cerebral ischemic injuries, and may also lead to permanent brain damage or death. Kernicterus. This is a form of brain damage that occurs in children with severe jaundice. If a doctor does not diagnose and treat the jaundice quickly, the excessive amount of bilirubin in the child’s bloodstream could develop into kernicterus. Stillbirth. There is no greater tragedy than the death of your child. A stillbirth can result from poor medical attention and care while a mother is pregnant or during the labor and delivery process. At Paulson & Nace, we understand that you are going through perhaps the most difficult time of your life. It is a natural response for a family to pull into itself and grieve. We want you to know that you do have options to help your child after he or she has suffered a birth trauma. Washington, D.C. has statutes of limitations in these kinds of medical malpractice cases, and even though all you may want to do is focus on your family, it is very important that you contact an attorney as soon as possible after the event to determine what help your family may be given. We offer you a safe space to tell your story to a team who is also a family. Paulson & Nace, PLLC, provides compassionate care and comprehensive legal services to grieving families throughout Washington, D.C. We have dedicated our lives to protecting medical malpractice victims, and we want to help you, too. To speak with an attorney in a no-obligation consultation, please call 202-930-0292 or fill out our contact form.